Ready for a megaton to start your day? Good, since we have one right now. It seems a ton of God of War 4 screenshots have been leaked online, as well as details surrounding the game. First off, the screens — if legit — which you can see in the gallery below, are obviously from an early build and as such, shouldn’t be representative of the final game. Heck, we don’t even know if these are the real deal, were from concept renders that were scrapped or in development, and whatnot. Also listed below are purportedly details for God of War 4 that state it’s set in Norse mythology, and we’ll see Kratos use an axe this time. – The surrounding environment could interact with the character (if Kratos brushes-up against the vines, they expell visible spores). Additionally, noted and reliable industry insider shinobi also chimed in and reaffirmed the “God of War 4 is set in Norse mythology” rumor over on Twitter. 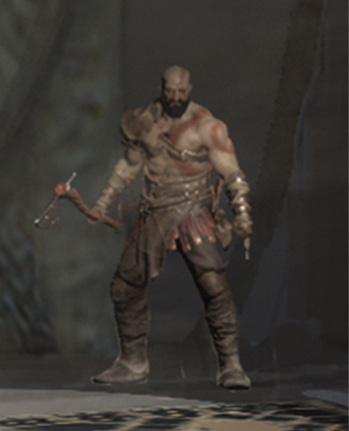 Bear in mind that all the details and screens that we’re digesting now can all be from an elaborate hoax, but if it is, there’s a lot of effort that went into it; I mean, the alleged God of War 4 screenshots that you can see below have a mix of in-game stuff and concept art. Also, the site that leaked the screens and details, NerdLeaks, are now down (along with its Twitter), which could point to the entire thing being a sham, or Sony sic its lawyers on ’em or something. We’ve reached out to Sony Santa Monica for an official statement and will update the article if and when they respond. What do you think? Is this the real deal or an elaborate fake? Would you want Kratos to return as the protagonist for the next God of War and the game be set in Norse mythology? Speaking of, don’t forget to read up on our God of War 4 feature where we explore how the franchise other mythologies.